“I am so sick of all this hype and nonsense. My inbox is so full of money making schemes, Business in a box, Internet millions, etc, it’s so sickening already. I’m at a point where I don’t believe anything.” – Jeffrey Yikes. Sure – there’s junk out there but if you see someone you trust recommending something proven to you and you don’t invest in it (when it’s an embarrassing $7) then you have a problem. This was in response to an earlier email where I was talking about the “Little Guy” who made big profits. The little guy in question is Eric Larson (not sure why Kevin thought it was him). 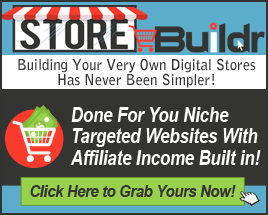 And Eric is “little” because he’s a newbie, had no list, no affiliates, no experience and no clue but found a simple way to make $20,987 in a few months. He’ll show you how for seven of your Earth dollars. And yes of course there is a non-essential upsell which I highly recommend you get. The $7 report shows you what to do – the upsell gives you Eric by your side (live) to help you get it up and running and making money fast.